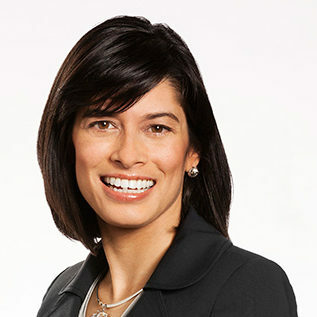 The Cooper Union’s Board of Trustees unanimously approved Laura Sparks’ appointment, which follows the conclusion of an extensive search process conducted by a search team with participation of alumni and faculty from all four schools. More than 300 applications were considered, and eleven of these candidates were interviewed at length. 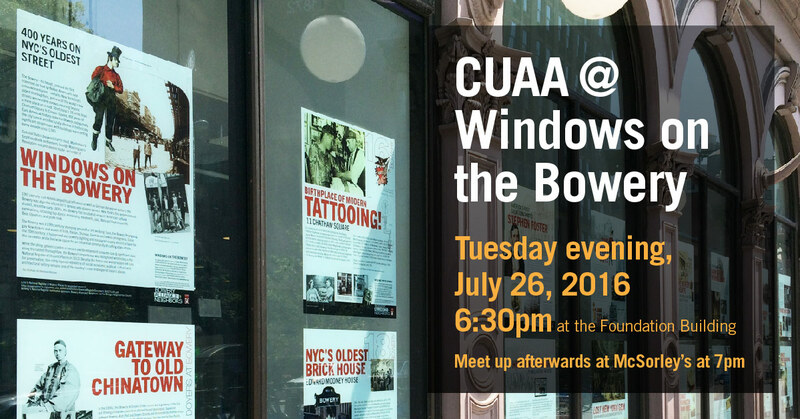 Cooper Union alumni and representatives of The Bowery Alliance of Neighbors came together on Tuesday evening, July 26th at 6:30 pm for a special tour of Windows on the Bowery, an exhibit in the Colonnade windows on the west side of the Foundation building . The first CUAA Council meeting for the 2016/2017 school year was held on September 21, 2016. At this meeting the new officers and council members were welcomed and given an orientation. The Council also approved the Certificate of Amendment of the Certificate of Incorporation of the Cooper Union Alumni Association, incorporated under Section 803 of the Not-for-Profit Corporation Law, and revised by-laws to support the Constitution approved by the Alumni Body in May 2016..
After approval by the council, meeting minutes will be posted on our website here. More information about the council can be found here. Class Reps and Regional Reps Are Needed. Outreach and Fundraising – Call on alumni, parents and friends to be involved and participate in Cooper and CUAA programs and events such as Phonathon, CUAA Pop Ups, CUAA Elections and Cooper Meetups. By reaching out to community members, we encourage support for today’s Cooper students. 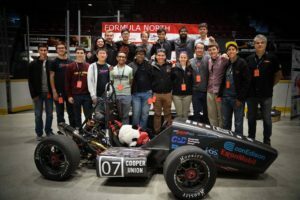 Networking – Connect classmates and Cooper through phone, email, and social media. Through our networks we are able to share and connect our community to internships, employment, social and cultural happenings and more. Events – Volunteer and give your time and expertise at an on-campus or regional event. Class reps are integral to the success of Reunion Weekend and regional volunteers plan pop up events to unite Cooper allies throughout the year. Jack Yogman was born in 1920. He graduated from The Cooper Union with a chemical engineering degree in 1948. Jack Yogman became president and chief executive officer of Joseph E. Seagram & Sons, Inc. on July 29, 1971. He briefly served as Vice President at Esquire Magazine in 1977 and at the same time he served on the Board of Directors for Ward Foods. Jack Yogman ChE’48 served in the Cooper Union Alumni Association as a Council Member and as an Alumni Trustee. Jack is a member of the Lifetime Giving Society at The Cooper Union. Jack received a President’s Citation award from the Cooper Union in 1971. 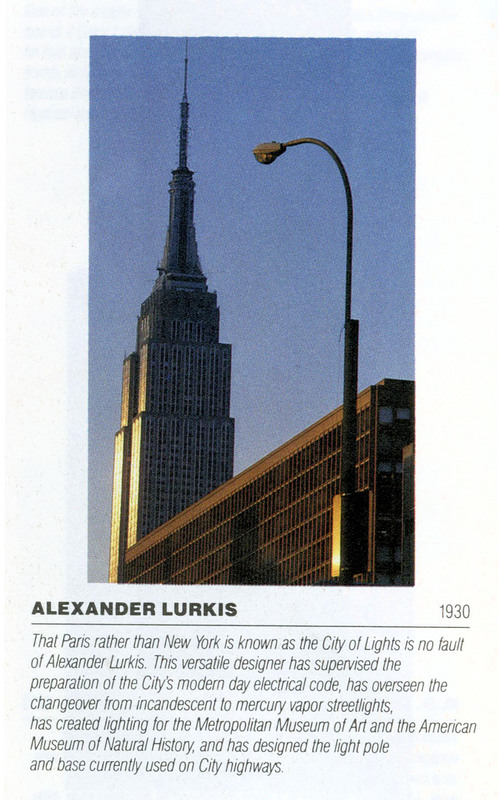 He was the CUAA Alumnus of the Year in 1986, and he was enrolled in The Cooper Union Hall of Fame in 2009. Alexander Lurkis was born on Oct. 1, 1908. He graduated from The Cooper Union Night School of Engineering in 1930 with a degree in Electrical Engineering. He married a fellow Cooper Union student, Carin Tendler Lurkis A’29, in 1930. 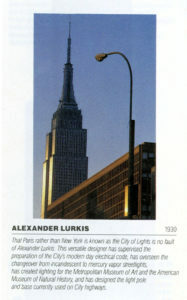 Alexander Lurkis designed a new book lift 42d Street Public Library in New York City. He has 11 patents covering utility poles, traffic signals, and security systems. He predicted future of gas turbine for peak power before the Federal Power Commission. 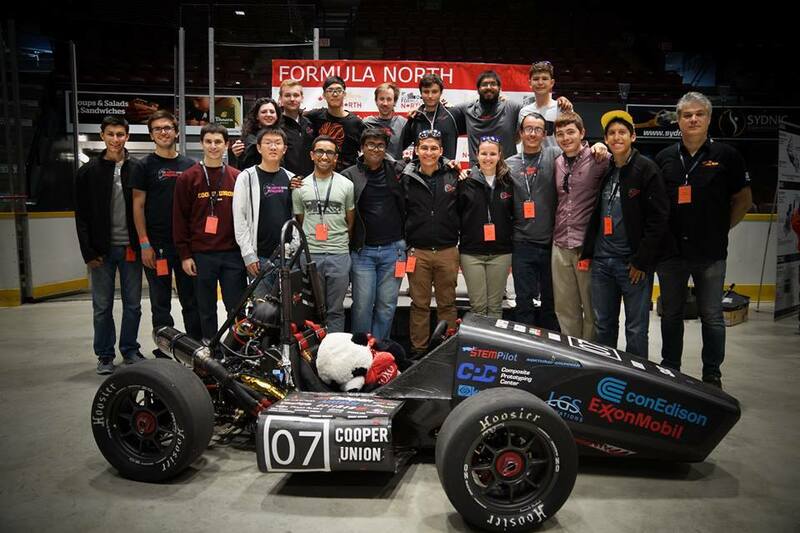 The Cooper Motorsports Team began the new school year by participating in the New Student Orientation and the Peter Cooper Block Party on September 3, 2016. The team has more than 30 students this year. 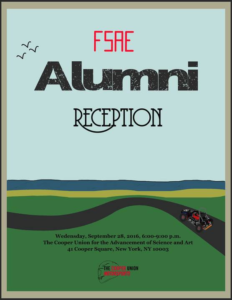 They are hosting a reception for Cooper Alumni on 9/28/16. 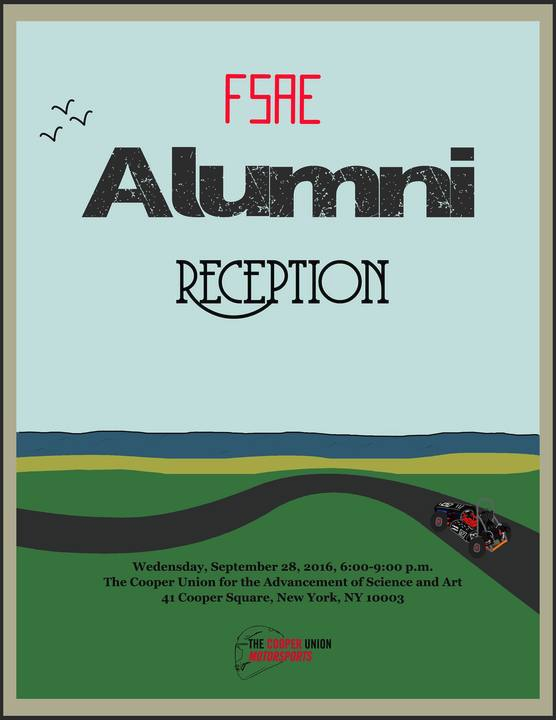 alumni working in the financial industries to a networking event in celebration of the new school year. 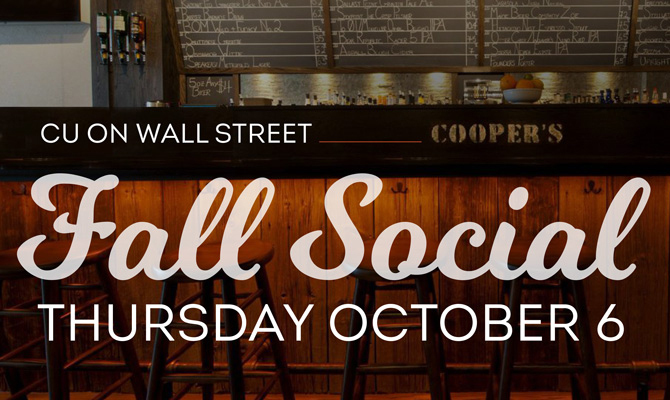 Fall Social will be held at Cooper’s Craft & Kitchen—a restaurant and bar inspired by our founder Peter Cooper! 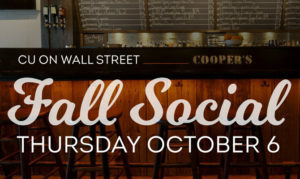 Bring a friend, build your network and reconnect with Cooper over refreshments. between 18th and 19th St.
Mock Interview Night is New and Improved! for the first time ever, we are opening up Mock Interview Night to alumni and students from all Cooper schools. The Office of Alumni Affairs and the Center for Career Development are seeking art, architecture and engineering alumni to volunteer and help current Cooper students practice their interviewing skills for internships, employment and graduate school. Wednesday, October 12, 2016. Please register to participate. This entry was tagged Alexander Lurkis, Jack Yogman, Laura Sparks, Windows on the Bowery. Bookmark the permalink.